These pretty clothes hangers are very easy to make and you can substitute the ribbon for fabric scraps if you like. Whichever you choose, this no-sew craft project turns a wire coat or clothes hanger into a homemade gift or a useful addition to your own clothes closet. Measure a strip of ribbon that is double the length of your clothes hanger. Glue the ribbon side seams together, wrong sides together, with fabric glue. Be sure to leave the center of the ribbon free of glue. You will need to slip your hanger through the center of the folded ribbon strip once the glue is dry. Measure another piece of ribbon that is double the length of the hook section of the hanger. Glue the sides together just as you did for the previous piece of ribbon, but turn in one end of the ribbon (wrong sides together) about 1/4 inch for a clean finished end. Untwist the wire hanger at the top hook. You may need to use a small pair of pliers for this. Try not to move the wire position, just untwist, so that you can feed the ribbon over the hanger. Feed the hanger through the ribbon, gathering as you go and leave each end of the ribbon at the twisted section of the hanger, keeping the twist free of ribbon. Once you have fed all of the ribbon through, twist your hanger back together. With the smaller piece of ribbon, feed the hook section of the hanger through this ribbon, gathering the ribbon as you go. You’ll end up with the ends of the ribbon at the twisted area of the hanger (this will be covered with a bow). For the very end of the hook, where you have a finished end of ribbon, secure to the hanger with a little dot of Household Goop glue or another glue that will adhere to metal and fabric. Tie a piece of ribbon around the neck of the hanger to hide all ribbon ends. 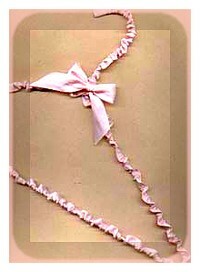 Secure this ribbon with a little glue, so that it won’t slip down to reveal the unfinished ribbon ends. Tie the ribbon in a bow. This is a quick and easy no sew project, but if you don’t mind sewing, replace the fabric glue with sewing. Additions: If desired, hang a small sachet of lavender or sweet-smelling potpourri around the neck of the hanger.